ETFs offer one of the simplest and easiest ways to gain exposure to emerging markets.Investors have poured billions of dollars in emerging market funds making them some of the largest in the fund universe.However investing in emerging markets via ETFs or an index fund is not the best way to capture the growth of these economies. In this post let me explain this theory using two examples. P.S: The MSCI data shown above are as of June 30, 2010. Private consumption accounts for 63% of the domestic economy. 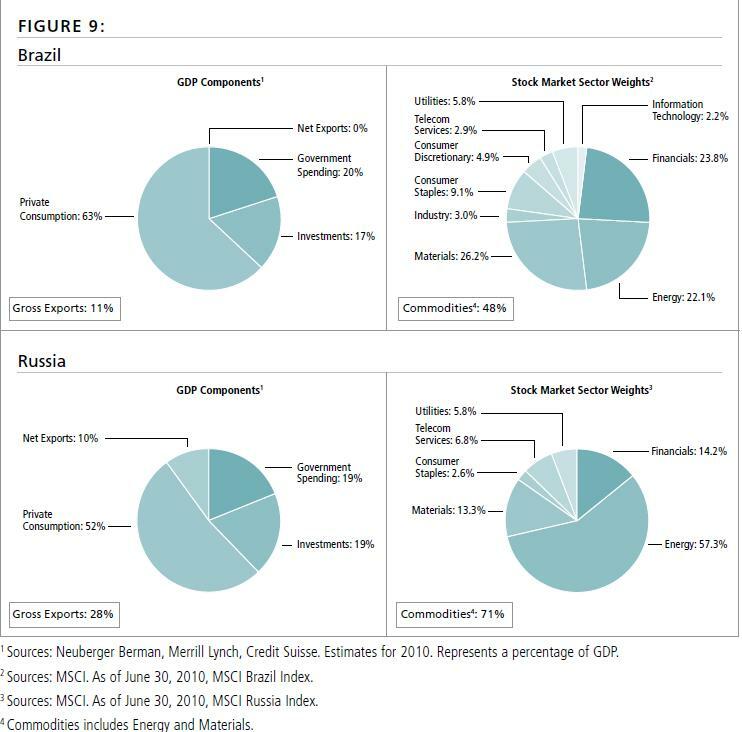 But the Materials and Energy sector comprise 48% of MSCI Brazil Index. The allocation for consumer sector is very less especially when excluding Financials. As the iShares Brazil ETF (EWZ) tracks the performance of theÂ MSCI Brazil Index, the ETF does not offer a complete representation of the local economy. Sales of consumer goods such as household appliances, cars, etc. are growing strongly in Brazil. However as of September end, the iShares Brazil ETF has about 14% assigned to the consumer sector. Hence instead of picking up this ETF, investors looking to gain exposure to the Brazilian market may want to do a bottom-up approach and select individual companies. Similar to Brazil, disconnect exists between the composition of the Russian economy and the underlying index. Private consumption is about 52% of the GDP. But commodities(Energy and Materials) constitute about 70% of the MSCI Russia index. The two country-specific ETFs available for Russia do not track the MSCI Russia Index. The SPDR S&P Russia ETF (RBL) tracks the S&P Russia Capped BMI IndexÂ and allocates about 64% to commodities. Consumer sector accounts for just over 4% in this ETF. Van Eck’s Market Vectors Russia ETF (RSX) which replicates the DAXglobalÂ® Russia+ Index also invests the most of the assets in the commodity sector. So investing in Russia via these two ETFs may not be the best way either.